While we encourage the use of image branding to proactively build a relationship with applicants, we also recognize the need for many job-seekers to simply browse through a list of results until they find something interesting. Our Career Search Engine allows job-seekers to find individual job postings from all over the nation with an intuitive, dynamic interface. Our Career Search Engine is straightforward and easy to use. There are no pop-ups or endless sub-menus to get in the way, unlike other job search portals. Just type in what you want and go. Users can search via keyword, location, industry, or company. 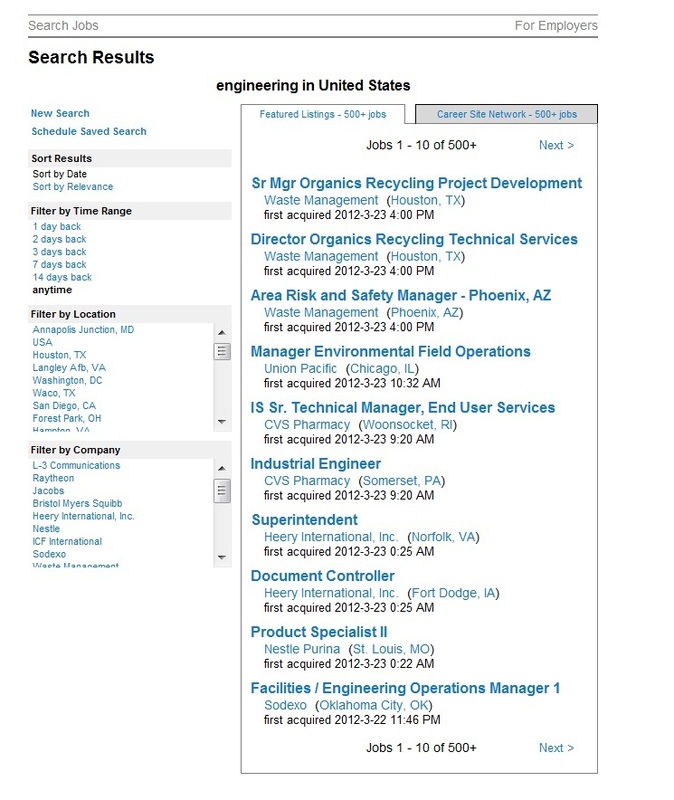 Search results come from two databases: our personal Featured Listings and US.jobs’s nation-wide Career Site Network. Between these two vast databases, users will always find what they’re looking for. Choose which jobs you want uploaded. Best for small quantities of jobs with more limited exposure as needed. Counts as a direct fiduciary relationship for compliance purposes. Does not require a career section on your company website. 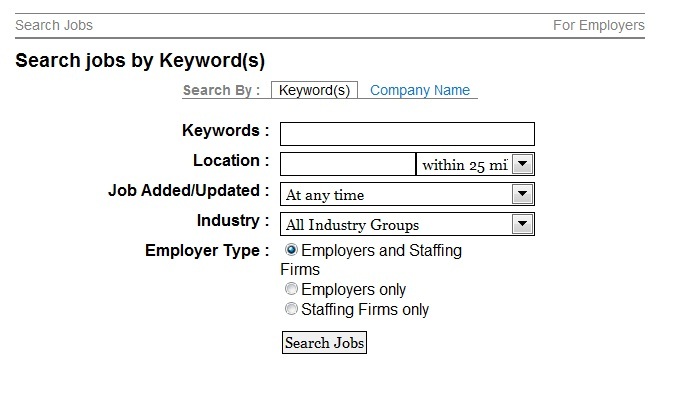 Job postings that are individually uploaded are displayed on our Featured Listings database, which appears first by default whenever a job-seeker uses our search engine to look for jobs in his/her area. Job postings seen here help serve to establish a direct fiduciary relationship that assists with legal compliance requirements. Incorporates all of your site’s listed jobs in our Featured Listings and Career Site Network. Only has a direct fiduciary relationship if primarily found on the Featured Listings. Must have a career section on your company website. Having your company website’s career section indexed into our search engine is an easy, no-hassle way of displaying all of your jobs at once. Also, nightly scans of your website’s career section means that your listings always stay up-to-date. But best of all, this incorporates all of your jobs into both our Featured Listings and the Career Site Network. The Network contains job listings from all 2500 affiliate members of the Job Central National Labor Exchange. Everything seen within the Network is visible to all of its members, giving your employment opportunities unprecedented reach to job-seekers. That’s exposure on over 2500 job boards for the price of one! Helps towards good faith compliance efforts! Direct fiduciary relationship: Intentional effort between two parties as illustrated with a transaction or contract. Compliance by association: Simply appearing only on the Career Site Network on our site or any others without any deliberate transaction or contract. However, if there is a a deliberate and conclusive attempt towards active diversity recruitment with a direct transaction, then those jobs can be seen as good faith efforts towards compliance requirements. Therefore in order to carry the effect of a direct fiduciary relationship, recruiting opportunities must first be present in our own Featured Listings tab. Posting to our Career Search engine is easy! Fill out all the required information on our Upload Form, plus any additional information you’d like to add. We’ll contact you within 1-2 business days to confirm your listing and arrange payment options. Each job posting has its own permalink, allowing you to link to your jobs from your website, Twitter, Facebook, or email newsletter. Agencies can receive their own accounts and upload job postings directly. This gives them full editorial control, faster turnaround, and less “middle-men”.